Have you ever heard of GeoCaching? It is a high-tech treasure hunt where "Caches" are hidden and participants try to find them using Global Positioning Satellite Receivers (GPSR). Once found, the "cacher" logs his or her find on the Web Site www.geocaching.com , which is the de-facto global home-base for GeoCaching. This (sport? game? hobby?) is a lot of fun and a great solo or family pastime. GeoCaching has grown incredibly in just a few years. 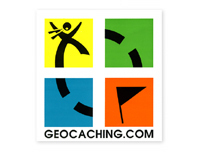 As of November 2005, there are some 362,000 registered accounts of cachers on www.geocaching.com . There are 225,829 active caches in 219 countries. In the last 7 days (as of January 11, 2005), there have been 140,488 new logs written by 24,554 account holders! In my hometown of Louisville, KY, there are 487 caches hidden within a 10 mile radius of downtown Louisville. There are many variations to game including, virtual caches, travel bugs, mystery caches, caching events and gatherings. One of the most interesting aspects is that of "Travel Bugs". Click HERE to learn more about travel bugs and see my travel bug, Evel Knievel. Visit www.geocaching.com to learn more about this interesting hobby and how to get started.